Cat-to-Human TB infection : First Documented Case! Public Health officials of England have reported the first ever documented evidence that tuberculosis (TB) can spread from cats to humans. In 2013, following an outbreak that involved 9 cats in west Berkshire and Hampshire, 2 people had reportedly developed active TB disease and 2 developed latent TB, following close contact with cats. Strains of Mycobacterium bovis, were reportedly the causative of outbreak in the cats as evidenced by molecular analysis at the government's Animal Health and Veterinary Laboratories Agency (AVHLA) showing that M bovis isolated from the infected cats and the people with active TB were indistinguishable. Transmission of M. bovis from infected animals to humans can occur by inhaling or ingesting the bacilli shed by the animal or through contamination of unprotected cuts in the skin while handling infected animals. 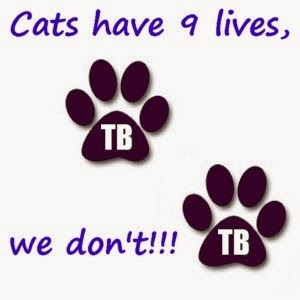 Between 2006 and 2012, about 30 cats in Britain were identified as infected with TB, however, findings from studies from Edinburgh University suggest that the number of cats with TB would be higher than previously been thought.